Is one of the largest aviation museums in the Southeast, is dedicated to presenting civilian, military, and experimental aircraft and memorabilia from the earliest history of powered flight. The 75,000 square foot facility houses over 100 aircraft, as well as engines, models, artifacts, photographs, and paintings. In addition, the Southern Museum of Flight is home to the Alabama Aviation Hall of Fame with over 70 biographical plaques presenting Alabama aviation history through collective biography. Active military & families are free. Annual museum family memberships are $65. Family memberships include reciprocal memberships with hundreds of other museums. Discounted group rates are available. SO HOW DID WE TAKE FLIGHT? With the approach of the centennial celebration of the city of Birmingham in the mid 1960s, a civic committee began working on projects that would tell the story of the first 100 years of the City of Birmingham. Mrs. Mary Alice Beatty, who, with her husband, Donald Beatty had been pioneers in the establishment of the first airline routes and bases in Central and South America, felt that the Aviation History of Birmingham should be included in these projects. The Committee’s goal was to establish a regional air museum, to be called The Southeastern Museum of Aviation, and Mrs. Beatty was placed in charge of the project with $400 appropriated for expenses. Using the Beatty’s own collection of memorabilia as a basis, in 1966 she established the first displays in six display cases. Samford University offered space for the displays, which, by that time, was called The Birmingham Museum of Aviation. The displays remained at Samford for three years, during which time Mrs. Beatty was the curator. Mrs. Beatty then moved the displays to a location closer to the airport, using the main lobby of the Birmingham Airport Motel, which stood at the location of the present short-term parking deck across the street from the old terminal. Groundbreaking ceremonies were held in 1978 at the museum’s current location, and the Southern Museum of Flight was officially opened to the public in the fall of 1983. After nearly three decades of growth and expansion, the Southern Museum of Flight is dedicated to investigating, preserving, and promoting the rich stories of Southern Aviation and to providing enjoyable, experiential educational programming for people of all ages. 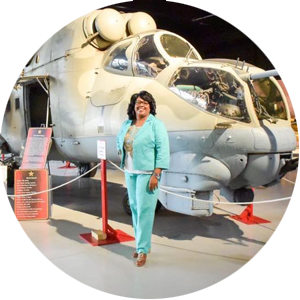 Through collaborative partnerships within the community, the Southern Museum of Flight provides a continuum of exhibitions, displays, and educational services with a sincere devotion to cultural and historical literacy. The Southern Museum of Flight prepares and supports skillful, reflective professionals who improve the quality of aviation education in a museum setting. The Southern Museum of flight presents civilian, military, and experimental aircraft and memorabilia from the earliest history of powered flight. The museum houses over 100 aircraft, as well as engines, models, artifacts, and paintings. In addition, the Southern Museum of Flight is home to the Alabama Aviation Hall of Fame with over 70 biographical plaques presenting Alabama aviation history through collective biography. 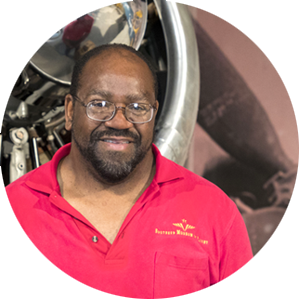 Brian has been a part of the Southern Museum of Flight team for over ten years. He serves as a part-time faculty member at Huntingdon College, the University of Alabama at Birmingham, and Miles College. Brian is a graduate of a number of military training schools including the United States Army Airborne School, and he currently serves as an officer in the United States Coast Guard Reserve. He completed his undergraduate degree at Texas A&M University-Corpus Christi, and his education includes a graduate degree in History from the University of Alabama at Birmingham. Brian also holds the Ph.D. from the University of Alabama and the University of Alabama at Birmingham. His research interests include Museums in the 21st Century, Collaborative Organizational Structures, Museums as Interdisciplinary/Educational Resources, and 20th Century Military History within Public History Settings. O to speed where there is space enough and air enough at last! — Walt Whitman, One Hour to Madness and Joy, 1860. What is your favorite part of your job? Watching The Students Face Light Up And Getting Excited About Learning About All The Cool Airplanes And History Of Aircraft. Wayne joined the Southern Museum of Flight in 2004, after retiring from the United States Air Force. In his 22 year career, he worked avionic systems, crewed many versions of the C-135 and learned four Slavic languages. He is the only Air Force enlisted graduate of the Marine Corps Weapons and Tactics Instructor Course. 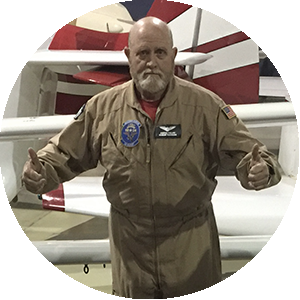 Wayne has worked at a number of aviation museums, and he has maintained vintage aircraft both flying and non-flying. He is a graduate of the University of Alabama at Birmingham, with degrees in History and Anthropology. What would people be surprised to learn about you? Lived in the Philippines as a child. Describe your dream vacation? Two weeks, end of September, in Garmisch-Partenkirchen, Germany. Zachary joined the Southern Museum of Flight part-time in June of 2011 and became a permanent member of the team in November 2011. 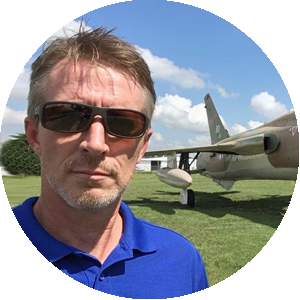 He previously worked for Alabama Aircraft Industries as a Senior Estimator on KC-135, C-130, P-3 aircraft and H-60 helicopter depot-level repair maintenance. He retired from the United States Air Force after 24 years. During his military career, he worked as a Crew Chief and Superintendent on C-5, C-141, C-130, C-9 and C-17 aircraft. He became a master instructor teaching C-141, C-130 and C-5 aircraft maintenance. Zachary has a Bachelor’s Degree in Business Administration from Talladega College, and two Associates Degrees from the Community College of the Air Force in both Aircraft Maintenance and Military Instructor of Technology. It is as though we have grown wings, which thanks to Providence, we have learnt to control. — Louis Bl—riot, Atlantic Monoplanes of tomorrow. Charlie joined the Southern Museum of Flight team in June 2014 with an extensive aviation career spanning over forty years. His career includes working as a lineman for Bill Woods Beechcraft and an estimator & planner on the C-12 Program. Charlie also served as a final assembly and operations supervisor on the USAF KC-135 Stratotanker, as well as the location manager for the Birmingham Airport AMR series and AMR Combs. Charlie attended undergraduate flight training at Williams AFB in Arizona. He graduated from Jefferson State in Business Administration and the Air National Guard Officer Training School, Academy of Military Science, as a member of the 117th Tactical Recon Squadron and holds a private pilot certificate from Bill Woods Beechcraft. Don't let the fear of falling keep you from knowing the joy of flight. — Lane Wallace, Flying magazine, January 2001. 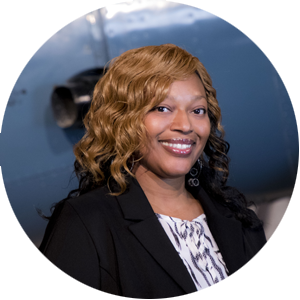 Melissa joined the Southern Museum of Flight team in 2014 and has served in the museum and University fields for over 15 years. Most recently, she served as the Director of Brenau University Galleries in Gainesville, GA, as well as the Assistant Director of Centre for Living Arts and Executive Director of the Pensacola Museum of Art. Melissa has received several international, national, and state recognition awards, and recently selected to attend the Association of Academic Museums and Galleries, Northwestern University’s Kellogg School of Non-Profit Management Leadership Seminar. She has held leadership positions for the American Alliance of Museums, Southeastern Museums Conference, and Alabama Museums Association as well as serving as a grant review panelist for the Florida Division of Cultural Affairs, and the Alabama State Council on the Arts. Ms. Morgan holds a M.A. in Art History and a B.A. in English from the University of Alabama and an M.B.A., Management, from the University of South Alabama. What is your favorite part of your job? Meeting and greeting visitors, and learning history as I work. What would people be surprised to learn about you? I love bungee jumping, and am looking forward to skydiving. What is your favorite part of your job? Being a life-long aviation and history buff... I enjoy working around aircraft, historical artifacts and a great group of people with the same appreciation in these areas. What would people be surprised to learn about you? That I'm an avid guitar player and I was in a local band until just a few years ago....also, that I designed and built several new homes around Birmingham, in my previous occupation as a home builder. Describe your dream vacation? Europe, especially to my ancestral homes of Scotland, Ireland & Wales.